No, it's not a purple cake. 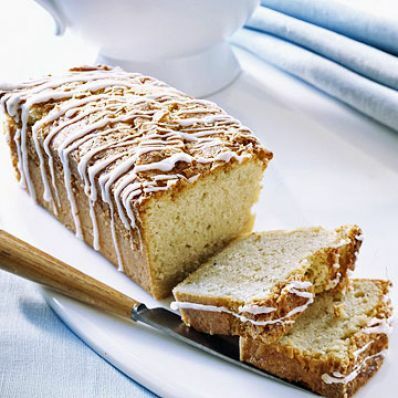 Dried lavender is added to a basic pound cake recipe. The first warm spring afternoon is the perfect time to bake this cake with sweet floral nuances. 1 of 4 Heat oven to 350 degrees F. Grease and flour two 8-1/2 x 4-1/2 x 2-5/8-inch loaf pans. 2 of 4 Mix flour, baking soda and salt in medium-size bowl. Pulse 1/2 cup of the sugar with the lavender in a food processor until lavender is ground. 3 of 4 In large bowl, beat butter, lavender-flavored sugar, remaining 1-1/2 cups sugar and vanilla until fluffy, 3 minutes. Beat in eggs, one at a time, beating well after each. In small bowl, combine sour cream and milk. On low speed, alternately beat in flour mixture with sour cream mixture in 3 additions, beginning and ending with flour. Divide between pans. 4 of 4 Bake in 350 degree F oven for 55 minutes or until tester comes out clean. Cool on rack 10 minutes. Remove cakes from pans and let cool completely. 1 of 2 Microwave water and lavender for 30 seconds on high power. Let steep 5 minutes. Strain out lavender flowers and discard. 2 of 2 Once cake is cool, whisk together 4 teaspoons of the lavender water and the confectioners' sugar. Drizzle over both loaves. Slice and serve. Makes 2 loaves, 12 slices each. Per Serving: 30 g carb., 3 g pro., 11 g Fat, total, 0 g fiber, 6 g sat. fat, 61 mg chol., 93 mg sodium, 227 kcal cal.